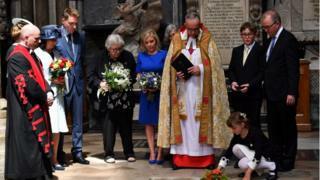 Tributes have been paid to renowned physicist Prof Stephen Hawking in a Westminster Abbey memorial service. British actor Benedict Cumberbatch, who played Hawking in a BBC drama, and astronaut Tim Peake were among those giving readings at the ceremony. Prof Hawking died in March, aged 76, after a long battle with motor neurone disease. His ashes are being buried alongside other great scientists like Charles Darwin and Isaac Newton. What was his science all about? English Astronomer Royal, Lord Martin Rees, and Prof Hawking's collaborator and Nobel prize winner, Kip Thorne, also gave tributes during the service. TV personalities David Walliams and Piers Morgan, musician Nile Rodgers and Prof Brian Cox were among those who joined members of the public to celebrate the life of the scientist. Prof Cox said Hawking was a true inspiration and recalled the effect the Cambridge physicist's book, A Brief History of Time, had on him as a 20 year-old. He told BBC News: "I'd done physics up to A-level but I was a musician at the time; and I was in that process of 'shall I do music or shall I do physics?' When that book came out my mum and dad bought it for me for Christmas. I read it and it re-affirmed - it really did - that [physics] is what I'd like to spend my life doing." To mark the occasion, the European Space Agency beamed Prof Hawking's words towards the nearest black hole to Earth. 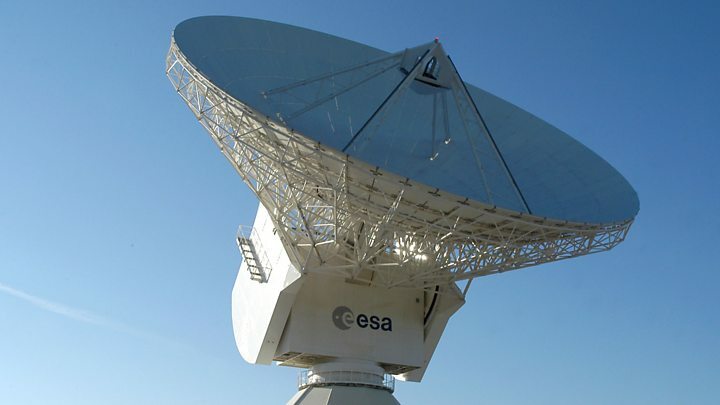 The transmission, which was sent from a big radio dish in Spain, was backed by an original score from composer Vangelis. Stephen Hawking said that science would take us on a path to "the mind of God". By that he meant that we would know everything that God would know, with the caveat, "if there were a God, which there isn't. I'm an atheist." On the face of it, the religious ceremony at Westminster Abbey was at odds with Prof Hawking's personal views. But hearing the choral works of Wagner, Mahler, Stravinsky, Elgar - and, of course, Holst's The Planets - filling the vast halls of the Gothic Abbey, one's mind was lifted beyond Earthly matters towards the ethereal. And that is what he did through his work - unravelling the mysteries of the Universe. Image caption British physicist Brian Cox said A Brief History of Time "re-affirmed... that [physics] is what I’d like to spend my life doing"
One thousand members of the public, from more than 100 countries, were offered the opportunity to attend the service, after a ballot attracted 25,000 applications for tickets. Guests were welcomed by volunteers from the opening ceremony of the 2012 London Paralympic Games. Also at the service were students who all use electronic communication devices to enable them to speak - just as Prof Hawking did. Rose Brown, 20, a student at the National Star College in Cheltenham, a college for young people with disabilities and learning difficulties, said it was a great honour to be present. Speaking through her synthesiser, she said: "He showed what people with disabilities can do. "I'm going to be an actress; everybody who puts their mind to something gets to be it. Stephen Hawking proved that more than anyone."